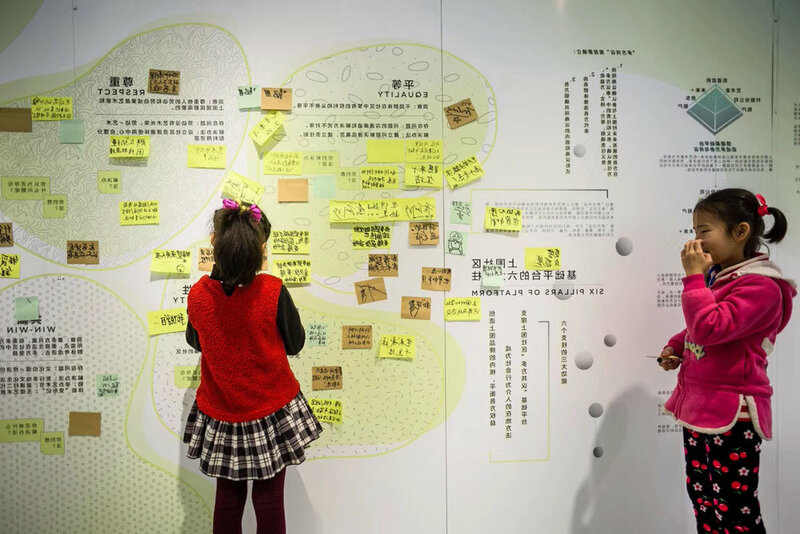 The research on the innovation mechanism of “Shangwei Art Community Sustainable Road” was commissioned by the Future+Urban and Rural Construction Institute. Through the 2017 Shenzhen-Hong Kong City\Architecture Bi-city Biennale, the various problems faced by Shangwei’s artistic development were made. Positive response. “Art Village” is not a new phenomenon for Shenzhen and even the whole country. The artistic actions of villages and towns can completely change the areas and spaces whose values re underestimated. However, when “art village” is a development strategy, its results tend to be unfair to those communities living in it, and it is not conducive to its own sustainable development. The entry of artists and creative people has made Shangwei Village in the early stages of this development. Residents of the Shangwei community have found it difficult to actually participate in this form of regional renewal, which stems from the lack of equality and respect among groups of different roles within the community, and even leads to conflicts and estrangements. We believe that in the principle of respecting equality, through the reassessment of the roles, work and assets of various stakeholders in the surrounding area, we have the opportunity to build a new mechanism to coordinate the transformation of the upper bound. After three months of research, the Sansi research team turned human discovery and design thinking into a guiding method for community building. 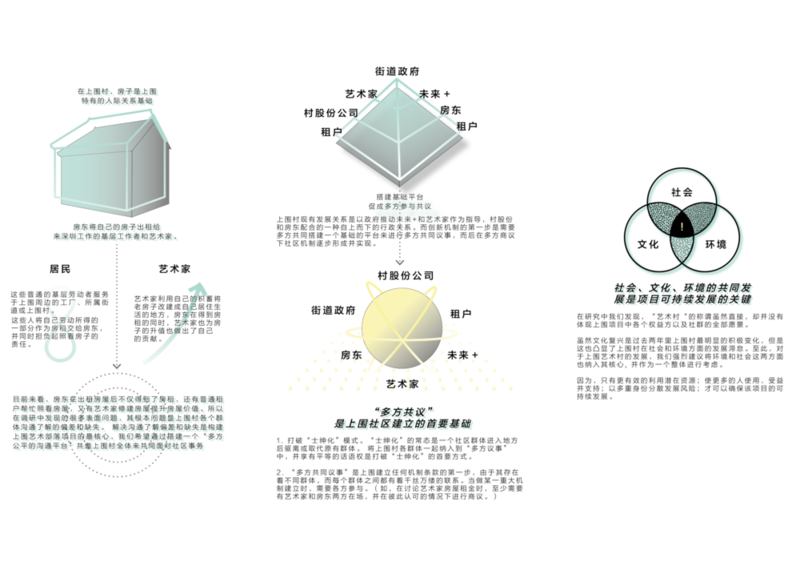 We hope that it is not a research that ends in the exhibition, but a mechanism that can truly grow organically with the development of the surrounding. Bringing a longer, sustainable transition to the surrounding community. Compared with Beijing and Shanghai, it is still very difficult to do art in Shenzhen. Many artists “respect the skills”. In the past ten years, due to the emergence of professional art galleries in Shenzhen; the promotion of art exhibitions by non-profit organizations; the increase of artists; the influence of Art Basel in Hong Kong; and the rise of young middle-class products, the art industry in Shenzhen has achieved unprecedented development. This page gives local artists more confidence in their creations. With the continuous improvement of the art eco-chain in Shenzhen, more and more people engaged in work related to culture and art began to appear in the daily life of the city in the form of individuals or groups, and began to shift to the countryside. The “798 Art District” where artists once gathered is now flooded with various commercial galleries, and perhaps only a living artist can be seen at the opening of an exhibition. Similarly, the Wuhu Art Village has attracted more young people to visit instead of artists. The reason why artists leave the art village/district is to make the artist overweight and rising rents, and the deeper reasons and contradictions are more and more “gentry” cultural production and consumption. The emergence of the art village and the problems it faced have received the attention of the government and began to intervene and support. At the end of 2015, led by Ye Hui, a member of Guanhu Street, Longhua District, Shenzhen, the artist Yan Junhua took the lead, and the Shangwei Art Village began to take shape. Since the second half of 2016, nearly 20 art/design-related workers have been stationed in Shangwei Village by individuals or groups. They are engaged in painting, film and television production, interior design, planning, and furniture design. Among the existing resident population in Shangwei Village, only 4% of the original villagers; 8% of the artists stationed; 88% are foreign tenants. Most of the foreign tenants serve as the grassroots workers in Shangwei and its surrounding areas. These families form a grassroots community with a shared spirit and extend the landlord and tenants; between tenants and tenants. Symbiotic relationship. The increase in rents and the natural geographical environment of the surrounding area are the main reasons why artists are stationed in the upper bounds and the issues they are most concerned about. The recognition of the cultural values and artistic atmosphere created by the artists is the necessary software for the integration of the artistic road of development. On the one hand, the artists hope that the government will use the "rental rent" to regulate rents. On the other hand, they also expect the community to spontaneously grow spontaneously and slow down the "rental rent" pace. However, the imperfections in the infrastructure of the village have always restricted the development of the Shangwei area, so improving infrastructure construction is the first step in development. 1. The construction and improvement of the infrastructure of Shangwei Village is a prerequisite for the development of the community. It is a basic livelihood issue for the community. 2. The establishment of an effective and fair community communication platform to enable different groups in the community to voice is a necessary condition for establishing and solidifying good neighborhood relationships. 3. Carry out community building under the premise of improving communication, and finally achieve respect for each other's value and symbiotic development. Shangwei Village is not just a village, it is not just an art village renovation plan. We hope to revitalize the old Hakka villages with the residents of Shangwei Village and the resident artists to create a sustainable new rural development model. While further renovating the infrastructure and environment, we hope that the artists and cultural workers will be able to work and live for a long time, and be as free from the unreasonable increase in price and rent. Try to avoid the commercialization and industrialization of the art village, and establish a healthy mechanism and format to make it benign self-development. Artists and cultural and creative workers participate in community activation and create communication channels to truly respect and treat different groups in the community and to collaborate with them. Create a more optimized community environment and cultural activities for the residents of Shangwei Village. Continue the friendly and harmonious neighborhood atmosphere and work together. Inclusive of new things and active participation in building communities. And hope to provide more employment possibilities. 1. Joint deliberation to confirm the responsibilities and obligations of the parties involved in the future development of Shangwei Village in the “multi-party discussion”. Confirm the responsible party, the beneficiary party, the support party, the party, etc., and clarify the responsibility and obligations. The establishment of the Shangwei art tribal mechanism through “multi-party consultation” is the innovation of the basic platform. According to the principle of “multi-party consultation”, local stakeholders and experts or consultants are invited to discuss the issues and affairs of the village. And solve, and on this platform, the various stakeholders will discuss the development mechanism of the Shangwei art tribe, instead of following the text. In addition to the "multi-party consensus", we also proposed the six pillars of the platform for suggesting matters. The six elements of equality, respect, diversity, win-win, sustainability and symbiosis are the main criteria for the establishment of an audit mechanism and problem solving. The innovative mechanism of the development of Shangwei Art Village focuses on providing a platform for fair participation for all stakeholders, allowing governments, village stock companies, landlord individuals, artist tenants and existing residents to participate and achieve multi-party discussions. The form of the platform can be diverse: from the cultural company of the state-owned enterprise property; the extension of the village company, to the cooperative company through the feasibility study. The six principles of equality, respect, diversity, win-win, sustainability and symbiosis are the decisive elements of the mission and goals of the basic platform of the community. By embedding these principles into the application of the underlying platform and the involvement of social behavior, the issue of fact-based and straight-faced villages is promoted. These principles can also be used as an essential element of social impact assessment, opening up this project to social entrepreneurs and impact capital. In addition, these principles can also create a solid brand core for Shangwei Village and develop into the assets of the village.